Here are five on-trend one-pieces, that are ready for some fun in the sun. SUBOO Zanzibar Belted One Piece, $220: The belt on this one-piece not only helps to create the illusion of a cinched in waist, but also lends to a polished look. For those who want to show a little more skin, the plunging neckline will help to work on your tan (line). ROXY POP Surf Long Sleeve UPF 50 One-Piece Swimsuit, $120: Long sleeve swimwear is super trendy. Loving that the fabric of this one-piece provides sun protection (it has UPF or ultraviolet protection factor) and there is also a cool neon zipper up the back. Billabong Sincerely Jules Dos Palmas One Piece Swim, $120: The ruffle detail on the straps is sweet and feminine…in contrast to the minimal bottom coverage, which is downright cheeky (literally). 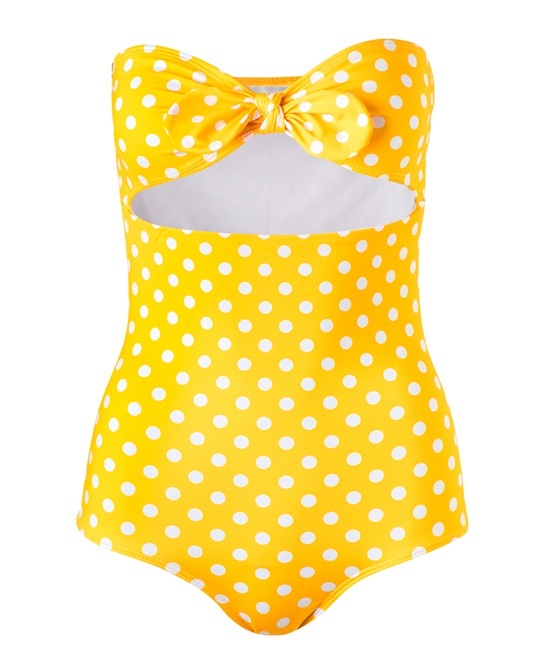 Verdelimon Fiji, $323: Our version of the itsy bitsy teenie weenie yellow polka dot one-piece, comes with a figure-flattering cut-out above the tummy. Yellow also seems to be the hue du jour right now. Something Navy Low Back One-Piece Swimsuit, $110: Tie-dye is one of spring’s hottest prints. The psychedelic pattern is popping up on all of our wardrobe staples, including swimwear.